An engine failure results in a prompt rescue of research pilot Jack McKay. In this historic photo from the U.S. space agency, on November 9, 1962, an engine failure forced Jack McKay, a NASA research pilot, to make an emergency landing at Mud Lake, Nevada, in the second X-15. 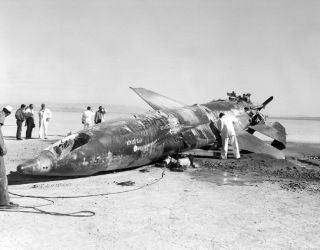 The aircraft's landing gear collapsed and the X-15 flipped over on its back. McKay was promptly rescued by an Air Force medical team standing by near the launch site, and eventually recovered to fly the X-15 rocket plane again. But his injuries, more serious than at first thought, eventually forced his retirement from NASA.